Johannesburg — The Regional Director’s Independent Advisory Group (IAG) has unanimously commended the Regional Director, Dr Matshidiso Moeti, for progress made so far in the efforts to transform the Secretariat of the WHO African Region into an effective, efficient and transparent organization. Their support came after a two-day meeting in Johannesburg which scrutinized steps put in place over the past year which included human resources reforms and an overhaul of the organizational structure recommended by an independent consultancy. 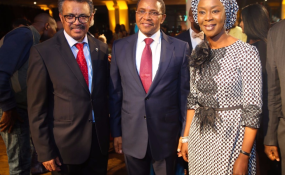 They believed the new transparent approach would serve the organization well to raise resources because it showed the WHO Regional Office for Africa (AFRO) was basing its decisions on evidence from neutral sources. “You have installed a transparent recruitment process which includes external evaluators. This is a clear sign that you want to be transparent, equitable and supported by those in Africa who need that support,” said IAG member and Algerian consultant, Dr Mohammed Belhocine. The IAG praised the review underway in WHO country offices which would see greater correlation between country needs and the actual staffing. “You will get support as long as you keep showing courage and determination to achieve results. Don’t lose the big picture, you are on the right path,” advised Dr Marie-Andrée Romisch Diouf, a senior consultant in development cooperation and global health from France. According to the IAG members, countries believe in WHO, and its guidance as the region’s foremost technical and political leader on public health was crucial in the overcrowded development landscape. IAG members provided candid opinions about what needed more attention. The Regional Director was urged to use her rightful authority to share evidence-based work with heads of state, finance ministers and other political structures to advance the health-related Sustainable Development Goals. AFRO should spearhead efforts to improve drug regulation and combat antimicrobial resistance, which poses a real threat to health and economies in Africa. Other areas included doing more research, engaging with academic institutions, and making its contributions much more publicly visible using new communication technologies and channels. News of the Regional Health Forum planned in 2017 was widely welcomed as a chance for AFRO to establish new links with partners in civil society, academia and the private sector, among others. Dr Moeti constituted the IAG in 2015 to provide strategic and policy advice for strengthening and orienting the work of WHO in the African region towards a more results-driven approach and better delivery. IAG members who attended the meeting were Dr Mohammed Belhocine, Algeria; Saran Branchi, France; Dame Sally Davies, UK; Dr Marie-Andrée Diouf, France; Dr Richard Kamwi, Namibia; Prof. Rose Leke, Cameroon; Dr Minghui Ren, China/WHO-HQ; and Dr Francis Omaswa, Uganda. Copyright © 2017 World Health Organization. All rights reserved. Distributed by AllAfrica Global Media (allAfrica.com). To contact the copyright holder directly for corrections — or for permission to republish or make other authorized use of this material, click here.